In Business – Your Team are the Fastest Way to Increase Sales! When was the last time you invested in your team to give them the training they need to sell more of your products or services? When was the last time you provided your team with sales training? We have used our extensive sales, and business experience to develop a program which is tailored to New Zealand small to medium businesses. We are involved with companies every day and often hear of the challenges and difficulties in sales and their team. The overwhelming need is to increase turnover and profit, and improving the sales technique of team is one of the most effective ways to make this happen. We have frequently been told, “We need to improve sales, but we don’t know how to do it”. It was this ongoing feedback that prompted us to design the BreakThrough Sales Training Program which is full of simple, practical ‘real world’ tools, information and examples that work. This program is structured for those who are new to the business, to those who have sound sales skills and more in-depth experience. Your team will learn the key fundamentals of sales process to more specific sales methods, which will help them sell more of what you offer, further develop sales skills and knowledge of professional selling skills and techniques. The content of this program has been based on research from industry experts, widely accepted sales principles and teaching of these concepts within businesses in New Zealand. The strategies we teach have been tried, tested and proven across a multitude of industries and GET RESULTS. 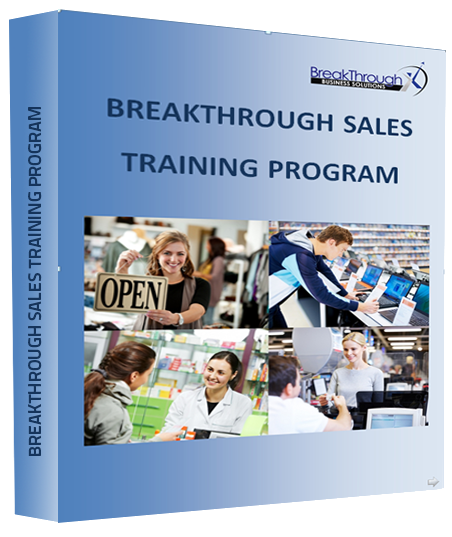 The BreakThrough Sales Training Program is made up of 3 key components and usually offered over a 3 month period. This allows for regular sessions with your team, and to give them time to learn new skills, techniques and put them into practice. The program includes tailored training sessions for you and your team with one of our BreakThrough sales trainers, as well as a comprehensive workbook packed with important information, examples and activity to accelerate learning to support continued sales success. We use an engaging, informative video to reinforce key concepts of each module, and an experienced facilitator to lead your team with workshops and discussions customised to your team and business. So this incorporates the best of different learning styles and caters to all team. We also are focused on long term change – not just a short term fix, so have a follow up program to ensure your team continues to use their enhanced skills to benefit your business on an ongoing basis. We have worked with Fiona and Bella from BreakThrough Business Solutions for the past year to enhance the performance of our sales team. The results have been exceptional with the team exceeding sales targets and expectations. Our sales have increased tenfold even while we have been integrating new sales people into the team. The tools and techniques provided in the sessions have been critical to the success of the team. The sales team have largely enjoyed the process and look forward to working with both Fiona and Bella over the long term. Fiona was recommended to me from a colleague who had attended one of her women’s events. We were looking for a different “voice” to address our Franchisees at our annual conference. HomeTech has been having its annual conference for over 20 years so we are very particular and focused on who we get as our Keynote speaker. HomeTech is in the service business installing Solatube skylights and ventilation nationwide through its franchised installation network. Fiona’s was fantastic. Rather than delivering a generic message Fiona spent a lot of time prior to the conference probing into how the business ticks and our expectations and the message we wanted delivered. This also involved interviewing several Franchisees before the conference. In Fiona’s presentations over two days there was lot of interaction with the team and breakout exercises. Fiona not only delivered the message; she took it to another level and well and truly exceeded our expectations. We have seen significant improvement in some of our franchisees performance in a short time. HomeTech is extremely pleased with the successful conference Fiona created for us. I would recommend Fiona’s services to any company that wants practicality, energy and value for money. We are extremely pleased with our investment. “I would recommend Fiona’s seminars and training to anyone regardless of the nature of their business, be it a new business or established one. Fiona’s training sessions with our staff were incredibly enjoyable, motivating and thought provoking. She bought fresh and strategic ideas for our marketing. Her vast experience in business is evident in her sessions and our staff were keen to put her ideas into practice. Fiona’s educational material was invaluable for our staff to assist our clients in the most effective and productive way.